The big news for 2013: Webmasters Nancy Friedel and Sharon Giles (that’s me) migrated the news blog from a Nucleus CMS platform to WordPress, principally because of the new features and capabilities that are built in. WordPress has a huge following and a large number of themes and plug-ins created to choose from. 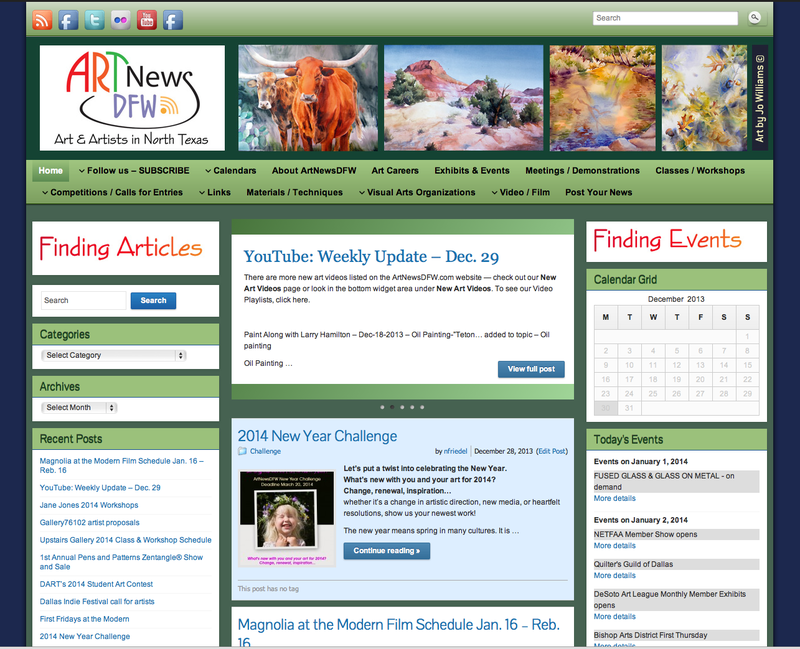 The URL is now ArtNewsDFW.com. 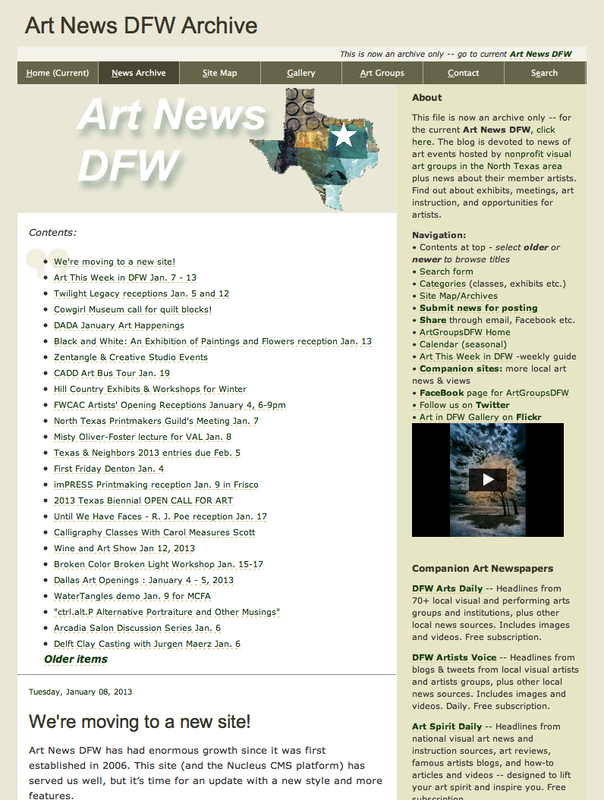 Because we had accumulated over 5,000 records since Art News DFW was inaugurated in 2006, we had trouble loading them all into the new platform. So basically, we migrated all the records from the last two years, and left the old site as an archive. Nancy is working on finishing that up and loading them all into one platform. So soon the archive will go away. Using the popular Graphene theme of WordPress, the look was completely redesigned. This is the old look of the archive using Nucleus CMS. Not only did we change platforms, but we transformed the design. Two columns went to three and the screen width went much wider. When the site was first set up in 2005, monitors were smaller and used less pixels in width so standards were different. Besides width options, we also gained the capability to display a “slider, ” which displays teasers of the latest five articles briefly. Plus we now have the ability to designate “sticky” posts, so that an important announcement can stay at the top of the page. The articles that we write (or are submitted by artists, art groups, etc.) are contained in the central window. We have now increased the number viewable to 30 from 25, because of the heavy number of submissions we now receive during the busy months of the art year. To reduce scrolling, only an excerpt and image are now displayed on the front page instead of the full text.